Many of my beer pals from "the other side of the water" aka what we call Canada in Michigan's Thumb have told me about how the craft brewing thing is finally starting to take hold in their country. They then suggest beers from over there I should try. The thing is though we have the same problem they have when it comes to what we can get our hands on. A lot of things they've got turned on to here aren't seen over there and not much from what's over there is making it here. We do keep our eye out for one another though so if there is something that is the rave on either side we put one aside for the next time a visit is made. Quebec's Brasserie Dieu Du Ciel was getting talked up a lot. Their Dernière Volonté in particular was scoring high points. It also happened to be a beer the brewery only made occasionally so I figured it would only be one I would hear legends about but never taste to find out for myself. My luck changed though when my friend Peter (host of the Avant Garage on Calgary's CJSW) would be back in the area for a few days and he was bringing me one over. Pouring cloudy and colored like an Indian Summer sun with a fluffy 3 finger head that took its time fading into a cloudy lacing and a strong cloudy cap that hung all all the way through the sipping. The banana like esters that come with a Belgian yeast were natural the first to great the nose with aromas of clementine and peaches providing back up. Many more things come out in the flavor itself with banana bread backbone plays host to tropical fruits, vanilla, coconut and caramel characteristics that come from it first hits the palate to mid way though a creamy but light touched texture. A mixture of grapefruit peel and white pepper nudge there way in towards the finish. Grassy hops and a bit of guarded til now alcohol hotness take their bow at the end. As the beer adjusts and breathes though the fruits take up more of the spotlight. Very interesting levels all the way through that seem to take on a bit more soothing quality which each sip. Making a mental note right now (and most likely firing off a group message in a few minutes) to hint to my Canadian friends that "Wow! 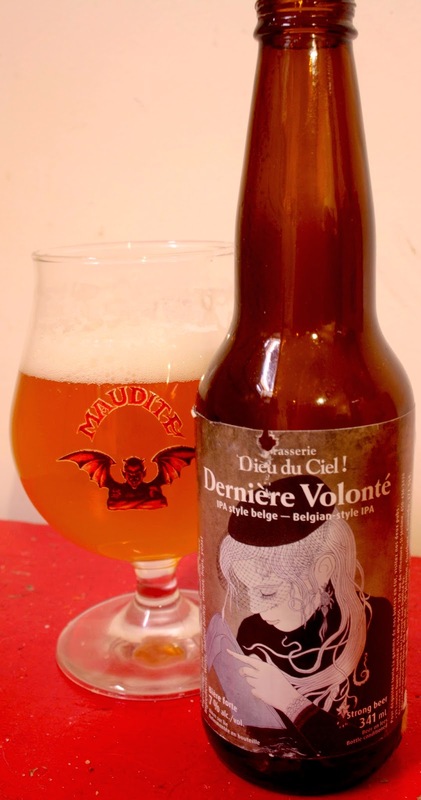 I really liked that one Brasserie Dieu Du Ciel I have tried. What else have the got available" in an attempt to remind them to bring other things they make on their next visit over here. I'm glad you liked it. This is one of my favourite Canadian breweries. I will look for more for you, when I'm next out that way. I was reading up on some of their other brews. Looks like they've got quite a few amazing things in their portfolio. L'Herbe à Détourne, Saison St-Louis, Aphrodisiaque and Gospel for instance. Well Peter, you do know where I live. Steve Mancha "Monday Through Thursday"